I have often noted the absurd prices that the fine, but not extraordinary, DeArmond pickups are offered at. This offer exceeds anything I have seen yet: a “sofort kaufen” price of 950 Euros for, no, not an 1100, but a simple FHC pickup! If you want one of these, check out American ebay, where they can often be purchased at less than 200 USD. I am one of those who admire Django Reinhardt’s post-war electric work. Of course, most people admire everything that Django did, but it is my impression that there is a general tendency to prefer the early Django (1934-1939) to the later Djangos and particularly the electrified Django. I think Django achieved a fantastic and unique mastery of the electric instrument. Perhaps he, unlike Christian, was too un-idiomatic, because very few players have tried explicitly to emulate his sound (this also goes for those many post-Django players who fit a Stimer pickup to their SelMac). That sound was produced by either an electric epiphone or a Selmer equipped with a Stimer pick-up, and a small tube amp (I have no idea about which kind). It is claimed, and it may be correct, that the Stimer(s) was a copy of the DeArmond pickup that originated in the early 1940s. However, even considerable experimentation with a SelMac clone, my DeArmond FHC, and a small tube amp has never made me capable of reproducing Django’s electric sound. The sound may (also) lie in the difference between the Stimer and the DeArmond. I have, unfortunately, never had occasion to try a Stimer, but would surely love to. Here is a brief review of the Stimer ST48. They are produced today by the famous luthier Maurice Dupont. The Twelfth Fret sells them. So does Gypsyguitars.com Note that there are (at least) two Stimer pickups, the ST48 and the more unusual model ST51, which fits the grand bouche SelMacs (also made by Dupont)Here are some pics of Mondine Garcia with the ST48 fitted the gypsy way. The DeArmond pickup concept was copied by numerous firms, most famously by French Stimer. One of the successful and prolific adopters of the DeArmond concept was Kent. I once owned one of these, which was fully as good as a DeArmond (FHC). The Kent equivalent to the DeArmond 1000 or 1100 is this beautiful pickup assembly. 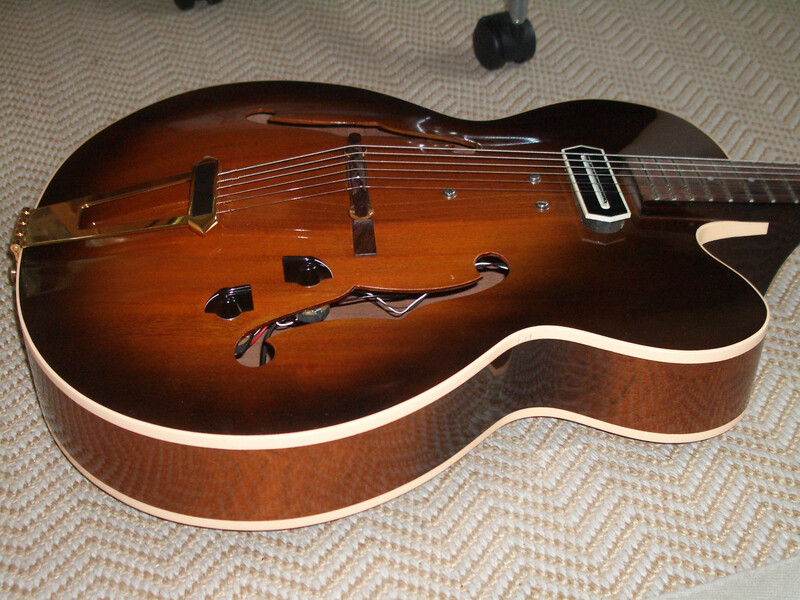 At 129 USD (buy-it-now price), this is one of the best archtop-related bargains currently on ebay. I have had a Charlie Christian replica pickup (of the UK-made kind) installed on my Heritage Eagle. I picked up the guitar today. It looks wonderful and it plays wonderfully!! The work was expertly done by Ole Kehlet, who had to use a whole day of work to install the pickup alone. Ole claims he is the only luthier in Denmark who is capable of doing it; apparently, this is how difficult that operation is. Anyway, this has been terribly expensive, but it is worth every krone of it: This is the best pickup I have ever heard. When played through a small tube amp, It is completely “authentic” in the sense of getting very close to that Charlie or early Jimmy Raney sound. The sound is fat, dark, woody, and mellow. The only problem so far. is a bit of noise but reducing the treble does away with that. Are we witnessing a tulip bubble in pickups? Buy-it-now prices for DeArmond pickups are rising rather dramatically. The increase in these suggested prices indicate that the prices at which the pickups are actually traded are increasing as well. Here is a seller suggesting a price of 899 USD for a DeArmond 1000 pickup and here is another seller suggesting a buy-it-now price of 850 USD for a DeArmond 1100 pickup. This is over the top! There is no doubt that these pickups represent excellent quality, but — in my book at least — they just cannot beat a Benedetto pickup or a handmade Kent Armstrong pickup — and they sell for much less. 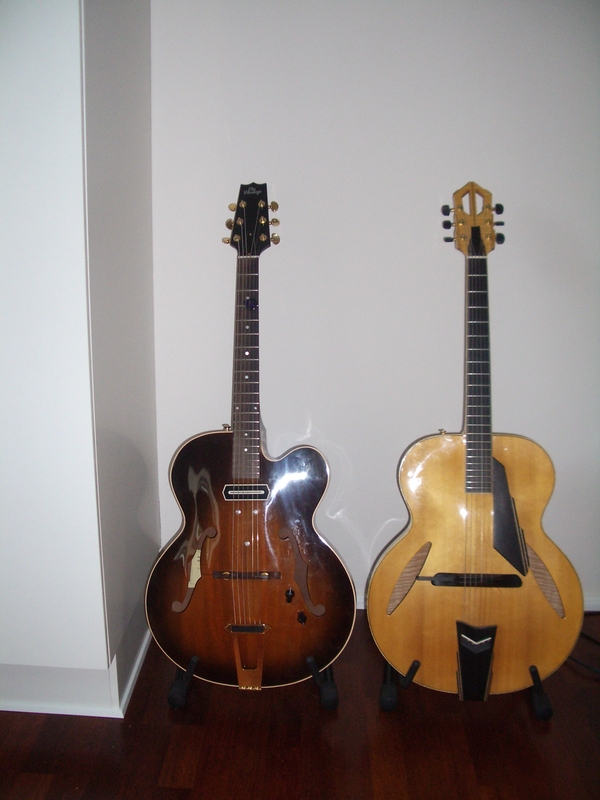 Suddenly there are archtops with Charlie Christian pickups all over the place. 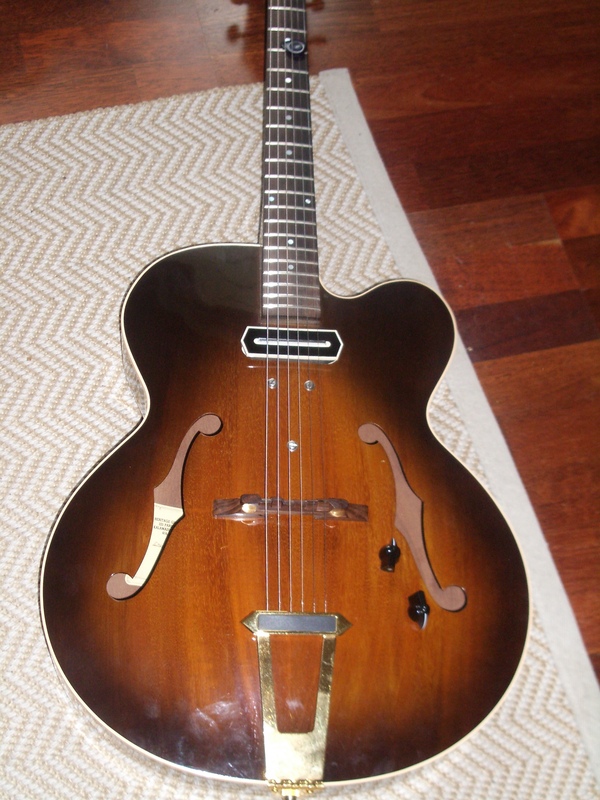 Here is an example of the short-lived and rare Gibson ES-130 with a later CC pickup addition. And here is a very clean ES-175CC.